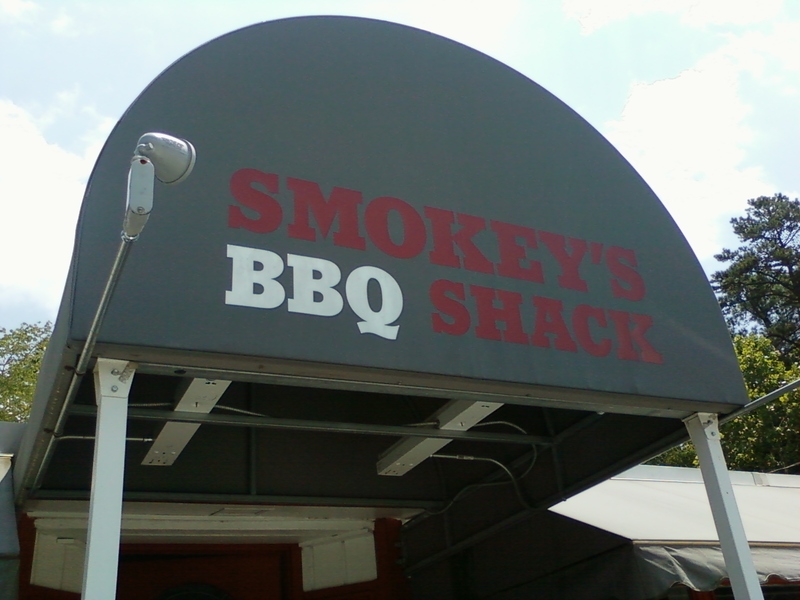 On their website, Smokey’s says it is “the best North Carolina ‘Q’ in Raleigh.” That is a dubious claim for a couple of reasons, not the least of which is Smokey’s location in Morrisville, which last time I checked was still a separate town from Raleigh (and even from bloated neighbor Cary). Even if it were located in Raleigh’s city limits, its claim to serve the best ‘cue in Raleigh is a) not accurate and b) wouldn’t be that impressive even if it were accurate, as Raleigh is surprisingly light on quality BBQ joints. So how is Smokey’s food? In a word, okay. In three words, not particularly memorable. The “pulled pork” (this term is rarely used in NC and is not a good omen in my experience) was a bit dry and bland, though the rough consistency of the chop was pleasant and there was a decent amount of outside brown meat chopped in. (The brisket and ribs, which seemed to sell as well or better than the pulled pork looked good but I did not try them.) The meat had a hint of smokey flavor to it, and there was a substantial wood pile behind the joint but I am not sure if they cook in an all wood pit; I think it is probably gas-fired with wood added but will happily stand corrected if someone has better info. The sauce was quite good, more akin to a dark Lexington-style dip with very little ketchup in it (a la Lexington #1’s) than the classic Eastern pepper-vinegar mix found at most places in the Triangle. The sides did not help the meal. The Brunswick stew tasted of tinny canned tomatoes and the hush puppies were quite overdone. On the other hand, the slaw was creamy and sweet and quite good. Smokey’s is an adequate spot for a RTP-area lunch, but doesn’t live up to its own hype. Yes, I think you are right: gas-fired with wood added. One of the proprietors showed me the set-up some time back. I haven’t eaten here in a long time, but the last couple of times it was purely for the brisket, which was quite good (heresy!). I also had them smoke me a turkey a couple of times for holidays and that turned out very well — much better than purchasing a pre-processed smoke turkey from Sams or such. I don’t know if they still do that. I can also agree! I was there two years ago (september 18th) and had the combo plate with Q, brisket, beef rib, and two wings plus one side. The Q was rather dry and chewy, with only smoke as flavor (too much smoke). Rib was okay, but a bit dry. Wings were smoky without any other flavor. Brisket was pretty good – almost melt-in-your-mouth tender with good flavor. Brunswick stew (my side order) was okay, but a bit strange taste. Puppies were hard and chewy and not too flavorful. Tea was pretty good. There was almost too much meat (DID I ACTUALLY SAY THAT!!!). Sat out back on picnic table. I gave this joint a 2.3 on my 1.0 (bad) to 5.0 (great) Q-Joint rating. Thanks for the affirmation guys! The smoked turkey sounds good, I wonder how many other joints do that. I’ve seen plenty that sell pork shoulders around Thanksgiving and Christmas but assume some places down east in particular do turkey. I am a big fan of Smokey’s as it reminds me of the kind of que I had growing up in north FL/south GA. Where exactly is “barebeque country” anyway? I’d argue the amount of smokiness of Smokey’s barbeque is pretty common to most barbeque regions– it is NC style of subtle smoke that is the exception rather than the norm. There is no one best place for barbeque in the Triangle. 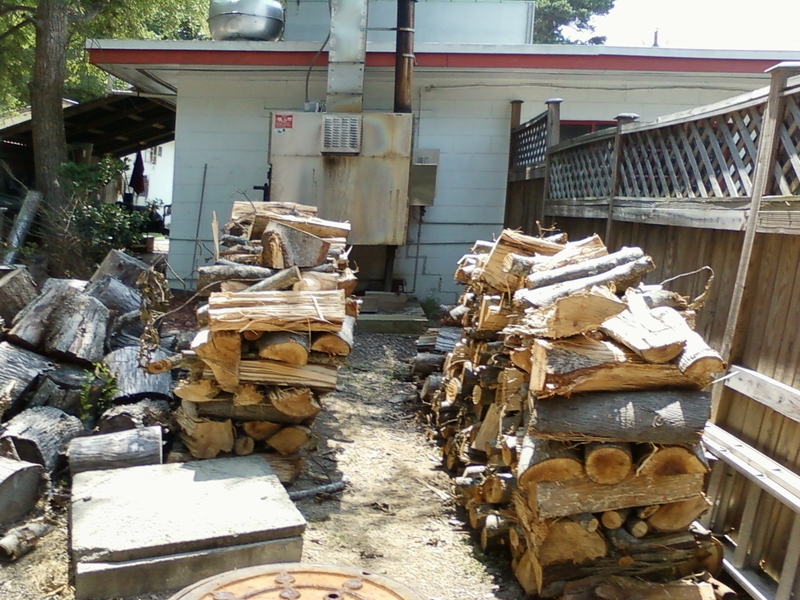 If I want NC style que I go to Allen & Son. If I want brisket I go to The Q Shack in Durham. If I want ribs and smoked wings I go to Smokey’s. You should give these items a try. And for sides I’d get their barbeque beans, mixed greens, and/or onion rings. Well, tonight for the first time I went and had ribs, pulled pork, and brisket. All dry and very flavorless. They do not serve standard NC BBQ as far as I am concerned. It was truly the worst I have ever had in NC, and I did not think it had any smoke taste. No smoke ring on the brisket either. The potato salad was flavorless, and the Brunswick stew tasted like ketchup. From my experience, I will not return.